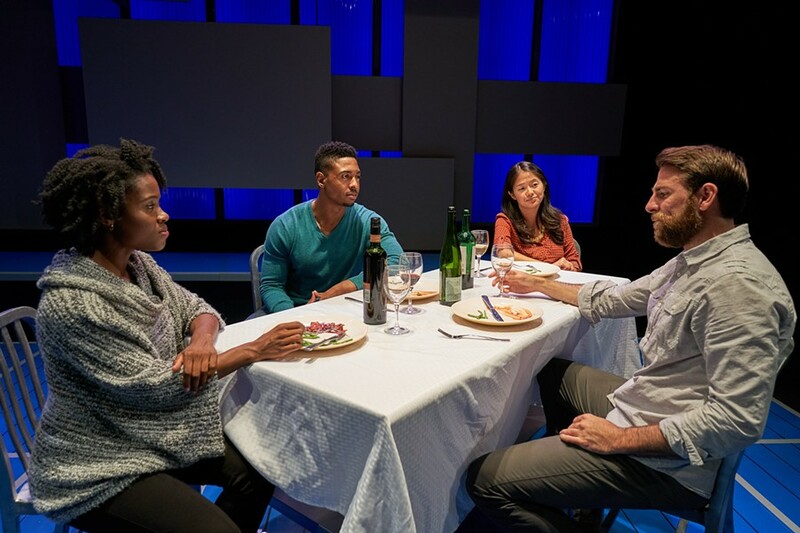 PHOTO BY JULIA PACHECO-COLE Folami Williams, Bryce Michael Wood, Shannon Tyo, and Jake Lee Smith in “Smart People” at Geva Theatre Center. There are a few topics people don’t bring up in casual conversation, as a rule — politics, sexual orientation, money, and race, to name a few. For heaven’s sake, just stick to asking about the weather, weekend plans, and the welfare of children or pets. Those topics, for most, are easy and non-offensive. But playwright Lydia R. Diamond isn’t here to play it safe. The award-winning author has penned several scripts about uncomfortable topics, and one of her latest works, “Smart People,” runs at Geva Theatre’s Fielding Stage through October 22. The play is a co-production with Ithaca’s Kitchen Theatre Company (the show played there September 3 through 24). There are only four roles in the show: a black female actor, a black male doctor, an Asian female psychiatrist, and a white male professor. Race and gender are important to mention in the character descriptions, because both are crucial to the plot. And “Smart People” has a “six degrees of separation, Kevin Bacon game” sort of plot, one that would feel contrived were it not for the deep issues that unfold throughout the storyline. It’s 2008, and Barack Obama is running for president. Each of the four “Smart People” call Boston home, and they are all struggling with the issue of race in some way. For Harvard professor Brian White (Jake Lee Smith), a research project goes awry; for struggling actor Valeria Johnston (Folami Williams), color blind casting is a new concept; young surgeon Jackson Moore (Bryce Michael Wood) resists the system in his residency; and psychiatrist Ginny Yang (Shannon Tyo) tries to help other young Asian American women find a voice. “Smart People,” while funny at times, is not a light show. It helps that the cast is impressively in tune with one another. Dialogue flows naturally and is impeccably timed, particularly for Wood and Tyo. The four characters could be neighbors, friends, and family members to anyone in the audience, and director Summer L. Williams brings both knowledge of Boston culture (where she is co-founder and associate artistic director of Company One Theatre) and her award-winning intuition as a director to the production. The cast, as an ensemble, presents one of Geva’s most impactful dramatic showings in recent years. The subject matter is, by nature, uncomfortable, but this cast is comfortable with the presentation. Even intimate scenes are handled with precision, and the fourth wall — that slender divider between audience engagement and observation — is by turns firmly in place and broken. Tyo is a force onstage as well, ricocheting between perfectly held together shrink and emotionally distraught shopaholic. Smith delivers a deft portrait of a professor everyone has met, stuck in his own head, which whirls with research; while Williams is an actor playing an actor, nailing the shudder-inducing “actor intonation” so prevalent in young stage performers. Scenic and lighting designer Tyler M. Perry has worked closely with projection and sound designer Rasean Davonte Johnson to create a minimalist set that becomes a hospital, a clinic, an office, a bedroom, a dining room, a lecture hall, and more. Projections are used intentionally, and accompanied by sound to enhance the metaphors they contain. “Smart People” is an apropos play in light of the near-decade since Obama’s election, especially. There is now a more desperate need than ever for open discussion and immediate action, and this show drives that home. The production follows the current season opener “In the Heights” and last season’s outstanding “Guess Who’s Coming to Dinner”to continue an important conversation at Geva and the community as a whole: one of diversity, inclusion, and acceptance.